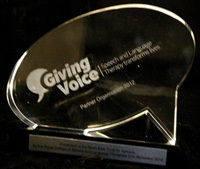 NETA is very pleased to announce that The Royal College of Speech and Language Therapists has chosen to award NETA for its involvement in the Giving Voice Campaign to raise awareness of speech and language therapy. NETA has been presented with the first Partner Organisation Award for joint work at a local level. NETA will be holding an event later in the Spring to celebrate this fantastic achievement.